Wightlink-Wight Mountain Cycle Race Team member Adam Holleyman took part in Ebike series in Monaco earlier this month. It's been a busy couple of weeks for the riders of the Wightlink Wight Mountain Cycle Race Team. Russell shares the latest reports. Riders from the Wightlink Wight Mountain Cycle Race Team have taken part in several races over the last week. Russell shares these reports. Three riders went back to Goodwood for the sixth summer series race held by Southdown velo last week and another two rode Portsmouth Track. With the support of the Wightlink Wight Mountain Cycle Race Team members, Adam Holleyman, delivered a fantastic result at the Goodwood Summer Series last week. A great position for Andy Holleyman in Spy Velo Time Trial Series as well as great efforts by Jerry Cooper and Russell Thomson competing in the Third Cat race at the Mountbatten Centre in Portsmouth. Riders from the Wightlink Wight Mountain Cycle Race Team Race have taken part in three races over the last week. Taking part in the Omega Portsmouth Circuits at the weekend, James Pett won the full ten points and secured his third cat license. Isle of Wight cyclists head to Goodwood race circuit for the first in the summer series competing in the E123 race, and Joe Staunton travelled to Chilham in Kent to race in the Tour of the Hopfields Support Race. 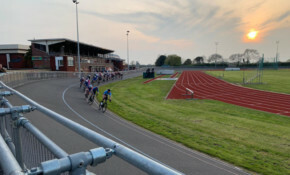 Matt Allsop from the Wightlink Might Mountain Cycle Race Team put in a great performance in the series of races at Portsmouth’s Mountbatten track. Good team work between two of the Wightlink Wight Mountain Cycle Race Team, proved beneficial as they raced at the Portsmouth Mountbatten Centre last weekend. Jack shares this latest report on behalf of the Wightlink Wight Mountain Cycle Race Team who took part in the Isle of Wight Seven Hills Mountain Bike event, as well as the Tour of the Marshes Road Race in Ashford (Kent) and Thruxton races.